Steep, icy mountains and deep fjords make western Norway famously scenic, but they also make life difficult for motorists. With seven ferries along the way, the nearly 700-mile trip between the cities of Kristiansand in the south and Trondheim in the north typically runs about 21 hours — at an average speed of about 30 miles an hour. But that could soon change. A $40-billion (€35.4bn) infrastructure project being planned by the Norwegian government aims to replace the ferries with bridges, conventional tunnels and what could be the world's first "floating tunnel." The submerged roadway — essentially a pair of concrete tubes submerged about 100 feet under the water's surface — would help cut the Kristiansand-Trondheim travel time almost in half while minimizing the environmental impact on the area. 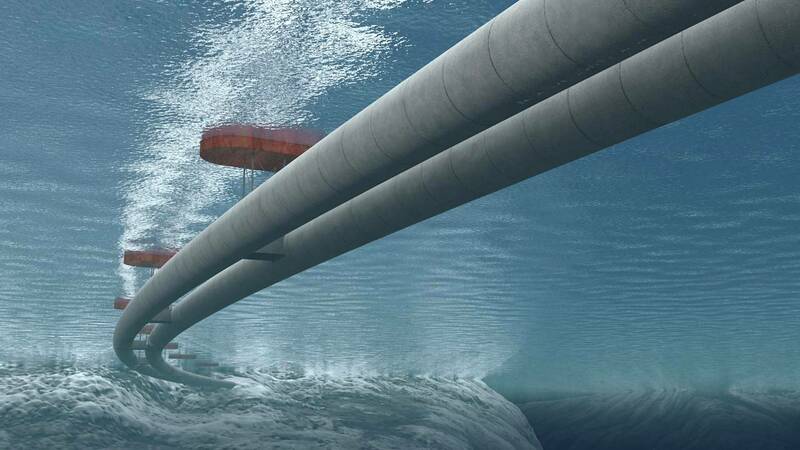 Experts say the floating tunnel concept is especially suited for deep fjords surrounded by steep mountains — features that make it difficult to build bridges or drill tunnels. "With bridges that span long distances, you need arches and suspensions at certain points, but for a submerged floating tunnel, if you do it absolutely correct and balance the weight of the structure with the buoyancy of the structure, it can go on forever," said Nils Erik Anders Rønnquist, a professor of structural engineering at the Norwegian University of Science and Technology, who is consulting on the project for the government. Though the floating tunnel is buoyant, it isn't actually floating. The tubes would be stabilized by cables tethered to the seabed or by pontoons floating on the surface at roughly 800-foot intervals. 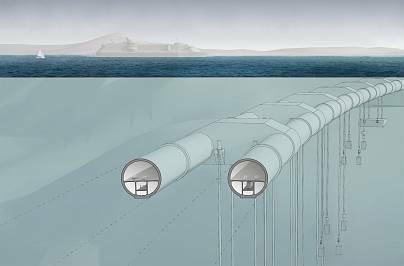 With most of the hardware far below the surface, the tunnel wouldn't interfere with the movement of ships and boats and even submarines, said Arianna Minoretti, chief engineer for the Norwegian Public Roads Administration. Like conventional tunnels, the floating tunnel would have escape routes that motorists could take to return to the surface in case of an emergency. And Minoretti said preliminary research regarding the proposed tunnel's safety has been reassuring. "We have done simulations for big explosions in the tunnel, we've checked for impacts of submarines, we covered scenarios where a trawler might hook onto the tunnel, and we even considered if a ship might be sinking at the surface and hit the tunnel on the way down," Rønnquist said. "I would say things are under control. It's a very robust structure." But Michael Mooney, a civil and environmental engineer at the Colorado School of Mines, said the trickiest part of designing and building a first-of-its-kind large structure would be anticipating all the possible hiccups. "You want to make sure you think of all the potential load scenarios or things like wave motion," said Mooney, who isn't involved with the Norwegian project. "The big challenge is recognizing where all the issues are and not being surprised by something." Kevin Chang, a civil and environmental engineer at the University of Idaho, offered a similar assessment of the challenges involved in building such a tunnel. "At the end of the day, the engineering community tends to be on the conservative side," he said. "But with novel ideas, somebody has to sort of stick their neck out to say: We think this is the best solution even though it's unproven elsewhere." Plans call for the floating tunnel to open to traffic in 2050. And while it might be the first structure of its kind, it might not be the last. Rønnquist said engineers in Italy and China are pursuing similar concepts.